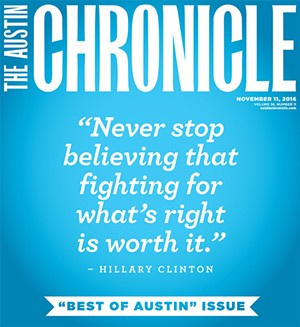 For the second year in a row, we’ve been awarded two honors from The Austin Chronicle’s “Best Of” issue. We’ve received The Critic’s Pick for Best Karaoke in the city, and The Reader’s Poll for Best Party Place. Words just aren’t enough to express our elation, our joy, and our thankfulness. When we re-opened The Highball in August of 2014 we knew two things: 1. The legacy of the old place would be hard to live up to & 2. We needed to gain an identity of our own. With your help we’ve been able to excel at both. We’ve become a national attention getting karaoke bar with the most insanely themed rooms in the country. We’ve thrown some of the biggest bashes in Austin (adult proms, Highballoween, New Year’s Eve) full of costumes, lasers, and an incredibly happy venue full of happy people. We’ve spotlighted some incredible new talent in Austin, and continued our relationships with some of the legends. As amazing and fun as all of that has been, it is amplified ten fold by knowing that the denizens of Austin took the time to vote for us to let us know: The Highball is The. Place. To. Party. So from the very bottom of our hearts, thank you. Thank you for every evening you’ve spent with us. Thank you for singing with us. Thank you for partying with us. And we can’t wait to see you again soon.